You are here: Home » News & Events » My Beautiful Intranet 2014 » Vote Vinarco, a truly beautiful intranet that really helps us get work done! Vote Vinarco, a truly beautiful intranet that really helps us get work done! Welcome to intranet homepages galore! 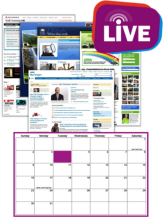 Want to review a plethora of intranet screenshots? We've designed a multi-part prize package that should satisfy any intranet or digital workplace team. This "gift bag" includes a free session with one of our user experience evaluators, 10 copies of "Digital Renaissance of Work" - a new book soon to be released, and more. Digital Workplace Group is a strategic partner, covering all aspects of an evolving digital workplace industry through membership, benchmarking and boutique consultancy services. © 2017 Digital Workplace Forum Group. Are you ready for the digital workplace? Learn and explore the new digital world of work. Are you ready to connect with DWG? I hereby acknowledge that the Digital Workplace 24 Video Library is designated for my professional use alone and may not be shared with any other parties, in whole or in part, without express written permission from the Digital Workplace Group.